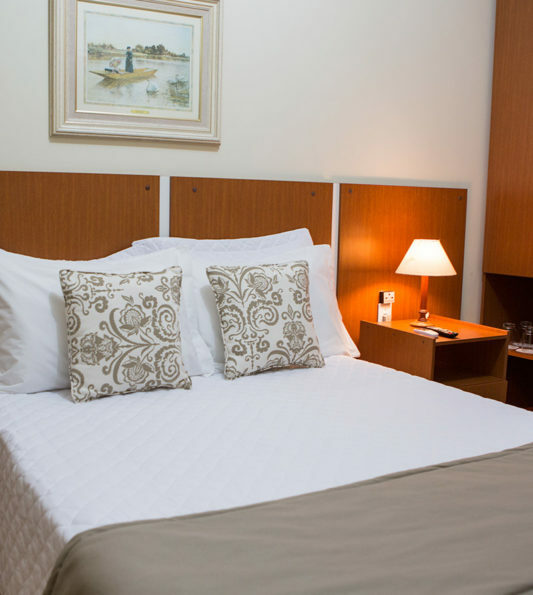 Kafé Hotel Guaratinguetá is located in downtown Guaratinguetá with easy access to all major companies in the area and near the best religious attractions in the State of São Paulo. It is located right across from the cathedral of Santo Antonio and the house of Frei Galvão, 5 km away from the Basilica of Our Lady Aparecida, 6 km away from the shrine of Frei Galvão and 30 km away from Canção Nova religious center. Walking around the area, guests will get to know the historic downtown, the bus terminal, shopping center and restaurants. Pioneer in the region and managed by the same family for over 6 decades, Kafé Hotel is a synonym of good service, comfortable facilities and excellent value for money for those travelling on business or for pleasure in Guaratinguetá and neighboring areas. Kafé Hotel experienced staff strives to welcome and support guests, meeting their needs. Free business center at the lobby for guests.